Do you dream of being able to make your own bread, but believe bread making is for “real” bakers? No longer. 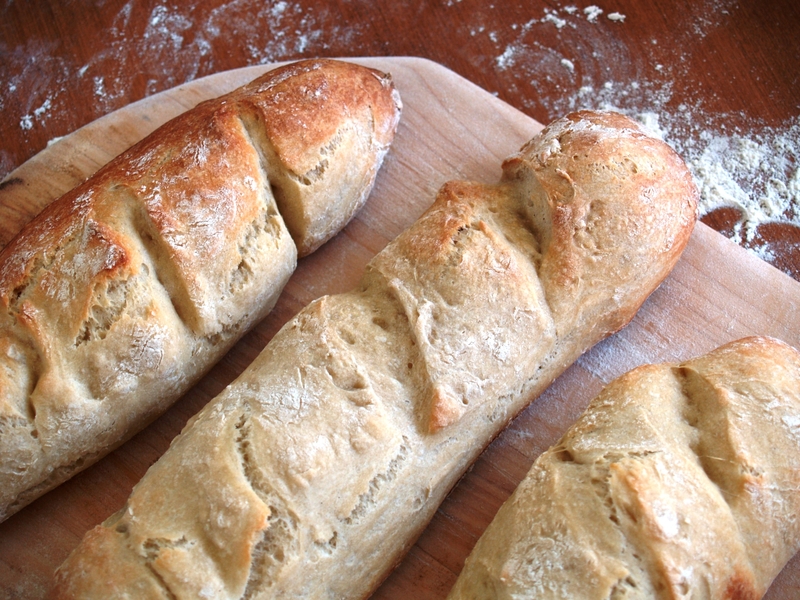 This bread is so easy, even YOU can make it. No kneading, no crazy ingredients, no picky, scientific processes. Just follow the directions, and you’ll have the most fresh and delicious baguettes in all of history! When we were in Grand Haven last weekend, our friends served us some of this bread for breakfast, and I HAD to have the recipe. The crust is delightfully crunchy, and the inside is soft and chewy. As any baguette should be! Smear with butter, jam, or honey. Alternatively, use it as an appetizer and dip it in oil and vinegar or use some savory spreads and cheeses. 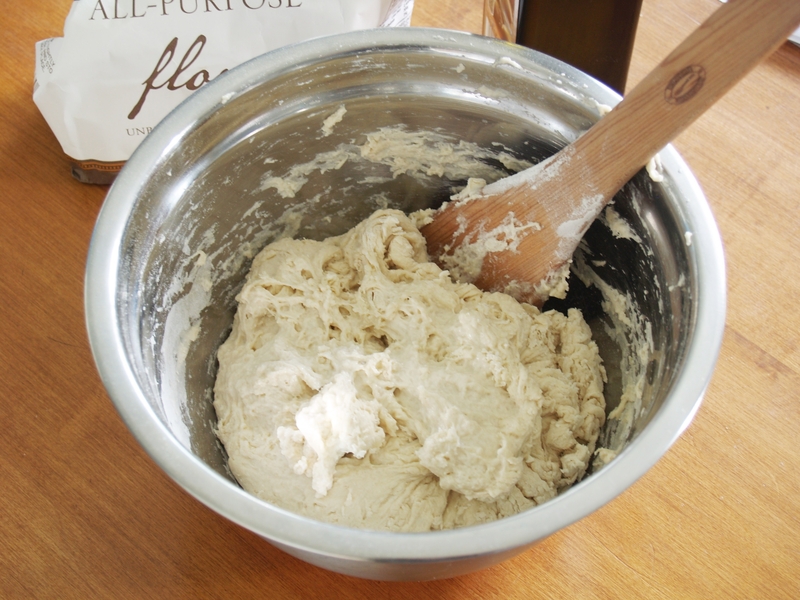 To make the dough, add water and yeast to a bowl. Make sure the water is roughly 100 degrees–lukewarm, just slightly warmer than your body temperature. Add salt and flour, and mix with a wooden spoon until everything is combined and there are no clumps of flour left. Cover the bowl and let the dough rise in a warm place for 2 hours. At this point, you can proceed with making your bread, or you can slide the dough into the fridge and leave it until you want to bake. When you decide to bake, dump the dough out onto a floured surface. Flip so the outside is covered. Use a knife to cut into three strips. 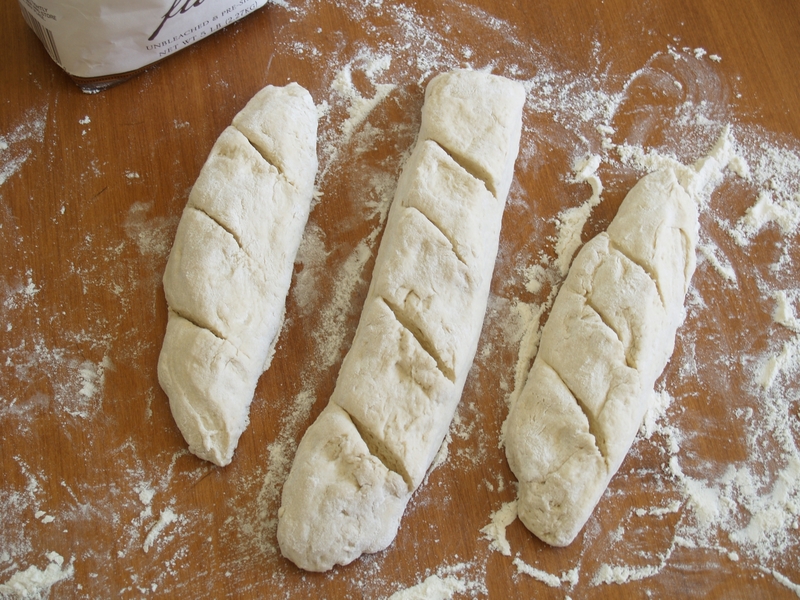 Roll each in flour, and cut 3-4 diagonal slits in the top. Cover again, and let rise. While rising, put the pizza stone on one rack of your oven and a bowl of water on the other. Preheat to 425 degrees, and bake for 20 minutes. It’s not necessary, but the bread will be tastier and the process much easier if you have a pizza stone and peel. You need it for homemade pizza, anyway. Go ahead and invest! Bake on a baking sheet or a pizza stone for 20 minutes. 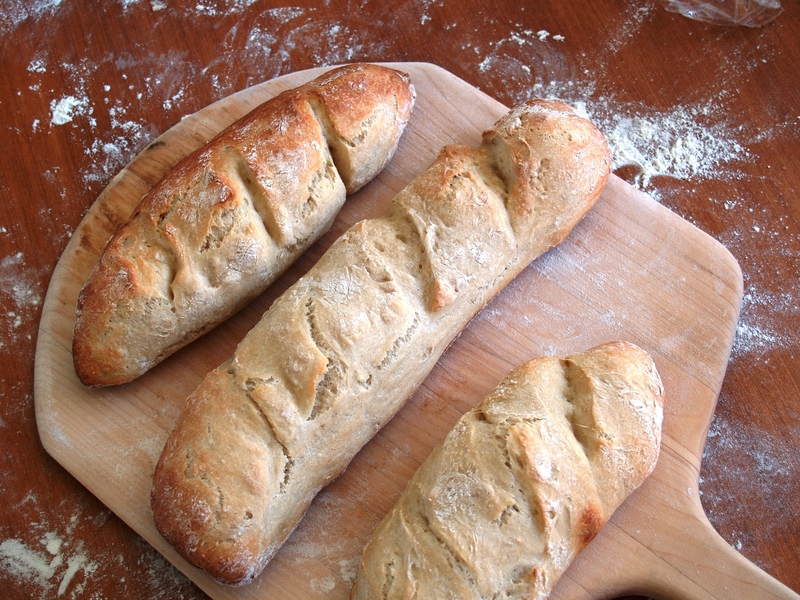 Recipe based on Artisan Bread in 5 Minutes a Day. P.S! For those of you trying to answer the age old question, “What’s for dinner?” more nights of the week than not, check out this FREE e-book! This e-book contains 4 recipes to get you started making delicious and affordable meals on your busy weeknights. It also includes variations on each of the four recipes so you can avoid the “this again?” rut. Get started this week! P.P.S. Some of the links in this post are affiliate, which means I will get a small commission if you make a purchase from this post. Thanks for supporting Balance and Blueberries!